To be honest, this is one of the best calendar I have ever seen. I was really excited when I was playing with Calendar. It is powerful and yet really easy to implement. 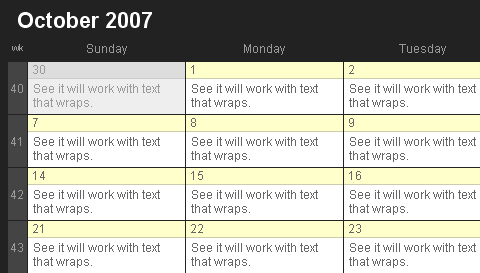 You can also have different CSS Styling for the calendar. 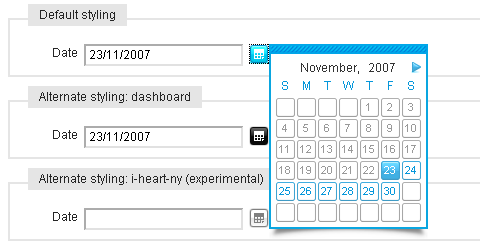 Calendar has been successfully tested in Safari, Firefox, Opera and Internet Explorer. The class requires Mootools 1.1 with Fx.Style, Element and Window. In order to enable dragging, the class also requires the Drag component. Web Application is getting more and more popular recently. They can be really useful because it can be accessed everywhere in the world with internet access. If you have an idea, do not know how to build it? NoGray might be able to help you. It is a small web design and development firm. They specialized in creating well-developed web applications for customers. NoGray focuses on 3 simple steps when working with clients. They will design the homepage and main template for the website which gives the client a clear perspective on how it will look like first. While the development, they will create a easy to use content management system to ensure clients can update or make changes to the application easily afterwards. After all, they will also submit your website to major search engines without you worrying about the SEO stuff.